Just Emkaying: Of Course I love you!!! "OF Course I Love You...Till I Find Someone Better"
Got Your Attention heh!!! Well It did catch my attention too when my Roomie Alampanah got the book home. Within minutes I was on the book. 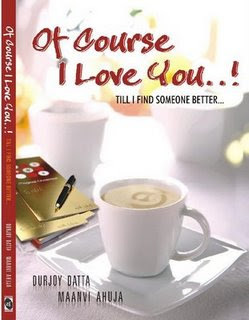 The book is written by Durjoy Datta and Maanvi Ahuja, aka Chethan Bhagat Style. If you have read 5 point someone, you will find the narrative quite similar and quite entertaining. Its set in Delhi college of engineering and is the tale of a dude who has problems and then he has "problems"!!! The best part of this book is that the entire story is picked out from his actual blog, which he used to scribble on. Someone picked out this stuff and he got it done into a book. Its a fantastic book, the story line keeps you wanting more (For Obvious reasons!!!) an has a nice end to it. Though the end doesnt sound realistic, Its a good book. Thats all that I can say, because you need to Read it!!! I got his blog too. This is his book and of course the man himself ( his running blog!!!) Dont bother searching for the books posts ,theyre obviously deleted!! !